Information on how to obtain the Ultima Weapon Keyblade in Kingdom Hearts 3, including the requirements to unlock the recipe and materials required. What is the Ultima Weapon? The Ultima Weapon has traditionally been regarded as the strongest Keyblade in the Kingdom Hearts series. It returns in Kingdom Hearts 3, boasting the best stats and abilities among all of Sora’s obtainable weapons. View our Ultima Weapon Keyblade Stats page for a full break down of the weapon’s attributes and characteristics. 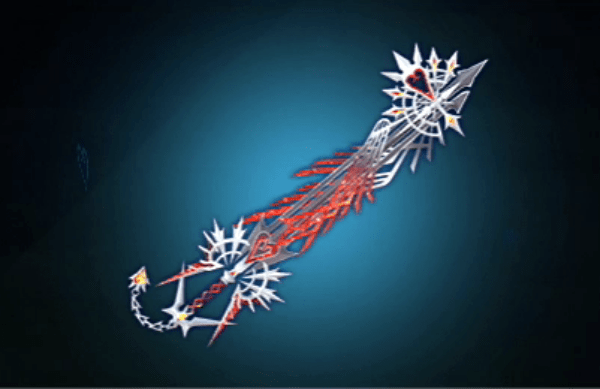 The Ultima Weapon is acquired via Keyblade Synthesis and requires certain steps to craft it in the game. Below are the conditions to obtain it. Collect 58 kinds of synthesis materials to obtain the Ultima Weapon synthesis recipe. Collect the necessary synsthesis materials to craft the weapon. Below are detailed explanations of how to go about the steps. When you have gathered at least 58 kinds of synthesis materials, you will receive the recipe for Ultima Weapon as a reward from Collector’s Goals at the Moogle Shop. Synthesis materials are obtained by defeating various enemies in the game or by purchasing them at the shop. Below is a list of the materials needed to synthesize Ultima Weapon. All materials except Orichalcum can be obtained via item synthesis. Orichalcum is obtained in treasure chests, as well as completing certain objectives in the game. The table below summarizes the method of acquiring all of them. In depth information on how to obtain Orichalcum can be viewed in this guide. Once you’ve gathered all the necessary materials, craft Ultima Weapon in the Keyblade Synthesis menu. Now you’re ready to take on the strongest enemies in the game! Where the Heartless Island in Pirates world? If I remember correctly, it’s the very tiny island just immediately west of Isla De Los Mástiles. It’s the same island that you can find Lucky Emblem 10 at. Can find the chest in a little grove of palm trees and bushes near the center of the island. Nevermind previous comment, double checked immediately afterwards. It’s at Exile Island, which is marked on the map. Not getting Orichalcum from flans. Completed them all with each one jumping for joy.